The French-Canadian pianist born in 1969, Marie-Laure Boulanger, enrolled at the National Superior Conservatory of Paris for Music and Dance in the classes of Jean Claude Pennetier for the piano, and Roland Pidoux and Christian Ivaldi for chamber music. From 1990 she was invited to play Fauré's Ballade with the Bayonne-Côte Basque Orchestra conducted by Robert Delcroix. In 1991 Marie-Laure Boulanger was awarded First Prize in Piano and was then selected to participate in the master-classes of György Sebök at the Ernen Festival in Switzerland. Later on, at the Rencontres Musicales de Villarceaux her special lessons with this emblematic world figure would leave their mark which has guided her to this day. 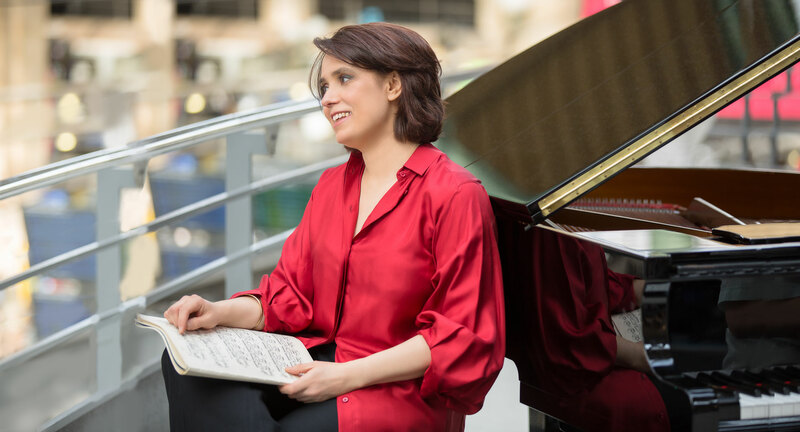 Marie-Laure Boulanger then honed her skills guided by personalities such as Yonti Solomon (post-graduate cycle at the Royal College of Music of London), Gary Graffman, and Craig Sheppard. She also received advice from Yehudi Menuhin (Rencontres Musicales d'Evian), Pierre Sancan, André Gorog and Jean-François Heisser. In 1993 Marie-Laure Boulanger was awarded the Beethoven Prize by Kendall Taylor. She was also winner of the Special Prize for the Best Interpretation of a Contemporary Work at the Guérande International Competition in 1999, and winner of the Jean Racine Prize in 1992 playing Liszt's First Piano Concerto. She also gained a State Diploma in Musicology from the Paris-Sorbonne University in 1994. In 1997 she recorded her first solo CD (from Liszt to Debussy and Fauré) and this was followed by a CD devoted to Beethoven with the Concorde Trio ("les grandes rencontres musicales"). Her concert-giving has taken her to the United States (Old First Concerts at the University of San Francisco), Great Britain (Windsor Festival, London), Italy (Lake Maggiore), Canada (MacGill University, and the Vincent d'Indy School in Montreal), She also participated in the1998 event "French May" in Hong Kong and in Macao in China. In France, Marie-Laure Boulanger has given concerts in notable venues such as Salle Pleyel and Salle Cortot in Paris, the Halle aux grains in Toulouse, the Toulouse-Lautrec Mueum in Albi, the Debussy Mueum in Saint-Germain-en-Laye, and also at the festivals of Villers-sur-Mer, la Vallée d'Orb, Radio France Montpellier, Radio France Avignon, Cantus Formus, Eurochestries d'Angoulême. In 2000 her interpretation of La Salsa d'Elissade by Thierry Pécou at the Orleans International Piano Competition was broadcast in Bruno Serrou's programme Les Chemins de la Musique on Radio France Culture, and in 2004 Marie-Laure Boulanger was invited to present a special broadcast on the composer Lili Boulanger for Michel Damian's programme Cordes sensibles on Radio France Musique. Committed to expanding her knowledge and its practical application, Marie-Laure Boulanger took up orchestral conducting under Stéphane Cardon, obtaining a Diploma in Orchestral Conducting at the Conservatory of Douai in 2010. She then continued her studies at the Ecole Normale de Musique de Paris in Dominique Rouits' conducting classes and also in Michel Merlet's orchestration classes. The year 2007 saw the birth of her Association Piano Cantate, a vital springboard to bring ambitious projects to fruition, aiming to principally promote French music of the 20th Century. Through this organism she founded a flexible ensemble with flutist Thierry Durand and the violist Françoise Douchet launching in 2013 a first "live" album Reflets devoted to the music of Debussy and Ibert with the soprano Magali Léger. A second album is in preparation with a programme based on the music of Liszt (release planned for 2019). Elsewhere the Association established the Musical Academy of Bellême, a youth summer school mixing music, theatre and musical comedy between 2011 and 2013. Marie-Laure Boulanger has been a piano and chamber music teacher at the Nadia and Lili Boulanger Conservatory in the 9th District of Paris since 1995.